It’s a franchise with a silly shtick – they take local water, filter it to “laboratory grade H2O” and then add “unique elements found only in New York water,” They call it Brooklynized (that’s a trademarked term, folks) water and use it in all the cooking, as well as selling it bottled. Oy. That said, the bagel was pretty good. It was the right combination of dense, chewy and crusty. The everything bagel had a good amount of salt on the exterior, which I find lacking in other bagels (I’m looking at you, Dunkin’ Donuts). 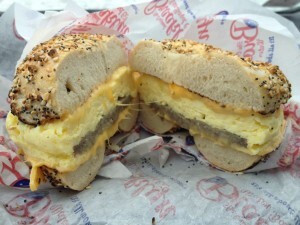 I got a sausage, egg and cheese breakfast sandwich ($4). It was awful; the flavorless egg was a thick, cottony patty, reheated in the microwave. The sausage was a sad, gray puck, again, no flavor. The cheese was gooey American and added nothing to the party. The bagel was the only redeeming quality. Long story short, get the bagels ($1 each), if you are in the area, but avoid the breakfast sandwich. They offer bialys, as well as flagels (flattened bagels).